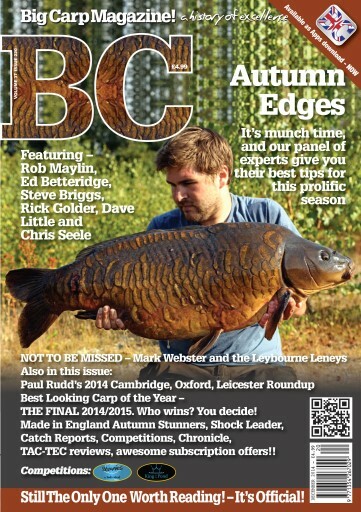 Autumn, ‘The Big Feed-Up’… Or is it? There was a time when I looked forward to the ‘autumn munch’ almost as much as early spring’s ‘carp clubbing season’, but in today’s high pressure carp angling scene is it still the case that the carp get on the grub to such an extent that catching is a formality? 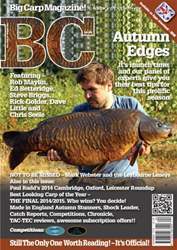 It was with this in mind and the demise in prolific autumn catches that I asked my team of experts to divulge how their own autumn tactics had changed in recent years and what edges they now employ to make the most of the last bit of decent session fishing before January arrives with its normal problems. (Winter will be looked at shortly in BC). There was a time when simply filling it in with a decent bait would yield prolific catches through October, November and even December until the prolonged frosty mornings took hold. Now it can be sudden death to employ such tactics! So what can we put this down to, and do they really use these months to stack on the weight to carry them through the winter months? It’s a question which needs answering with a variety of viewpoints, i.e. that of the full time angler with time to bait, watch and stay turned to the water, right down the scale to the one night a week family guy who arrives late on a Friday afternoon for his long-awaited one or two nights at his local water.